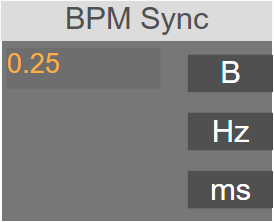 Outputs the BPM value in different formats. Outputs the length of a beatfragment in different formats depending on the host tempo. Hz: Note interval frequency in Hz. ms: Note duration in milliseconds.